How to Calculate Dietary Fibre for Children? Age of the child + 5g is recommended for children older than 3 years. This formula is also easier to remember than other methods by weight or energy level. Dietary fibre should come from food rather than supplements to ensure intakes of other nutrients. Because foods that are rich in fibre are also rich in other nutrients for e.g., vegetables and fruits. Get creative in making snacks for your kid and make this Khakhra Chaat loaded with high fibre ingredients like peas. All kids are fond of bite size snacks and they need small portions with nutrients packed in it, one such example is Oats Moong Dal Tikki which is power packed with protein and fibre. Tiffin treats are incomplete without south indian items. Here we have a variation of the basic chila Sprouted Moong and Methi Chila that your kids will enjoy during their school breaks. Soya and Til Crispies are perfect for tiffin treats as it’s a dry snack that won’t leak and will remain crisp for a longer time. Bulgur Wheat and Paneer Pulao is a yummy and healthier alternative to the regular rice pulao. It is packed with fibre, protein, vitamin A and calcium. Besan Paratha is a simple yet tasty and healthy paratha loaded with fibre, protein, phosphorus and B-complex vitamins. 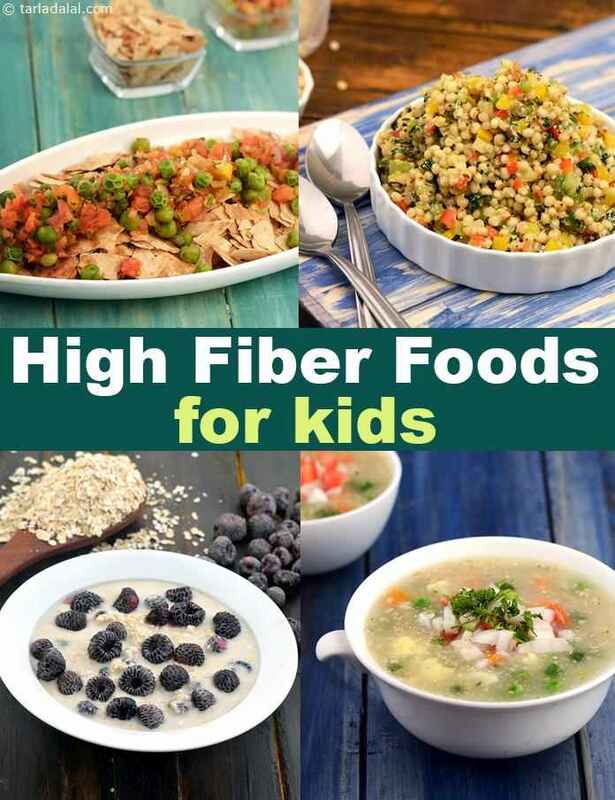 Enjoy our collection of High Fiber Food for Kids and realted Kids Food articles below.